Home » With Regard To or With Regards To – Which is the Correct Spelling? Prepositions link objects to other parts of a sentence. Usually, a preposition is one word, and a prepositional phrase contains the preposition and its associated object, like in the bathtub or outside the window. Sometimes, an entire phrase becomes a preposition, like with regard to. A prepositional phrase build on with regard to would follow a similar pattern: with regard to my watch and with regard to your earlier statement would be examples. You may occasionally hear a speaker or writer use with regards to, but as we shall see, you yourself should avoid doing so at all costs. 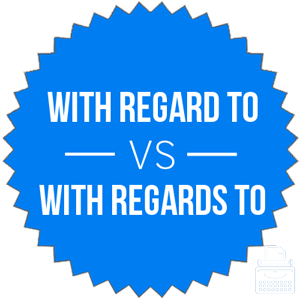 What is the Difference Between With Regard to and With Regards to? In this post, I will compare with regard to vs. with regards to. I will outline the correct spelling of the phrase so that you never misspell it in your writing again. Plus, I will show you how to use a memory tool, called a mnemonic device, that makes choosing with regard to or with regards to for your own writing a simple prospect. With regard to the bomb, I think we should only deploy it preemptively once we know the enemy intends to bomb us, as well. “With regard to dinner, my vote will always support pizza,” said Joba Chamberlain. With regard to is a useful phrase, but it can be unnecessarily wordy. An economical writer could just as easily shorten the phrase to regarding, or its synonyms concerning and considering. An even more economical writer might even use in or about to shorten the sentence even further. This chart graphs with regards to vs. with regard to in English book since the year 1800. While it’s not exhaustive in its literary scope, it still shows a clear long-term trend in favor of with regard to. To see in regard to vs. in regards to, see here. With regard to is the only spelling of this phrase that you should use. It is the grammatically correct version of the phrase. With regards to is poor usage. An even better option, however, might be to use the regarding or another preposition like in or about. Still, with regard to sounds fancy, and sometimes sounding fancy is necessary. Since with regards to shares an S with the word silly, it should be easy to remember that you look silly when you use the wrong spelling of the phrase. Is it with regards to or with regard to? With regard to is a preposition that signals a reference to the subject of a sentence. With regard to is the correct phrase. With regards to is a spelling error. Oftentimes, the simpler regarding can be substituted. 1 What is the Difference Between With Regard to and With Regards to?